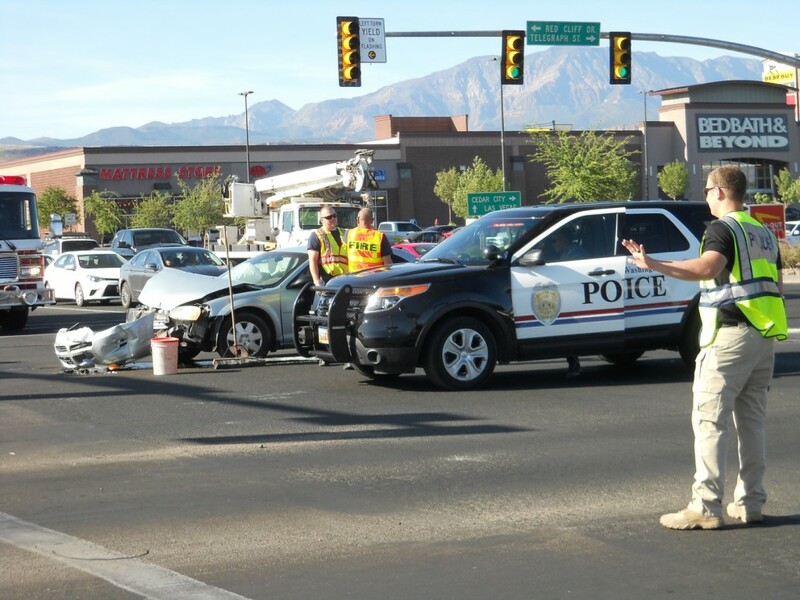 WASHINGTON CITY — While en route to the location of another vehicle collision near Albertson’s in Washington, a Washington City Police car collided with a silver Dodge Strata at the Green Springs Drive and Telegraph Street/Red Cliffs Drive intersection on Thursday. 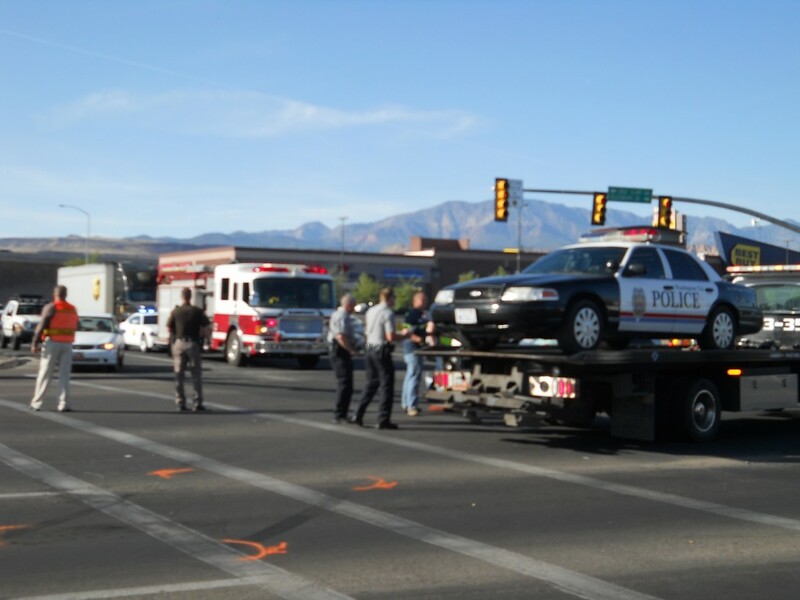 At approximately 5:20 p.m., a Washington City Police officer was driving westbound on Telegraph Street after being called to a vehicle collision just past Albertson’s in Washington, Utah Highway Patrol Trooper John Bates said. After turning on his flashing red and blue lights and sounding the sirens, he proceeded through a red light at the intersection of Green Springs Drive and Telegraph Street. At the same time a silver Dodge Strata was headed southbound on Green Springs Dr. and did not stop, possibly due to the other cars that were obstructing the view, Bates said. The accident resulted in congested traffic and affected all lanes of travel. At around 6 p.m. the intersection was cleared and all lanes of travel were able to move freely again. 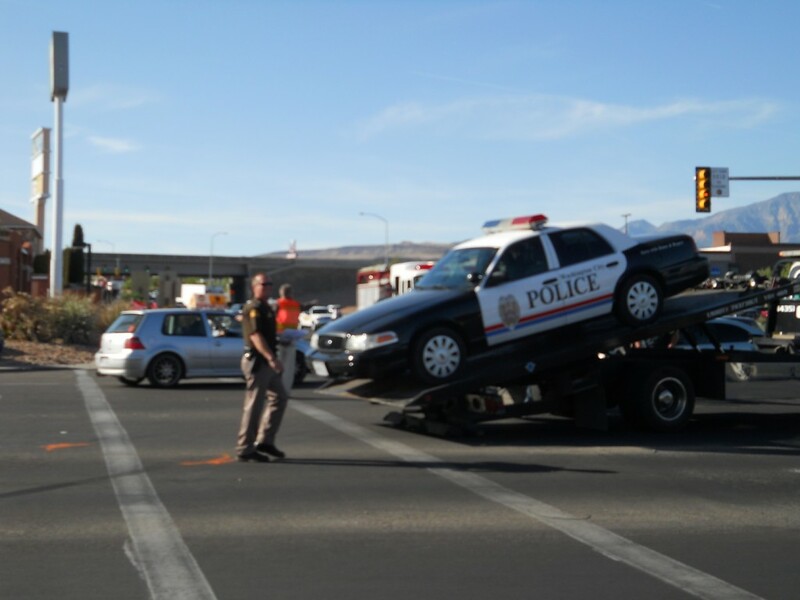 In the case that this incident involved a Washington City officer, Utah Highway Patrol was called to investigate. The case is still under investigation as of Friday Morning and will be passed to the Washington City attorney’s office once the investigation is finalized, Bates said. 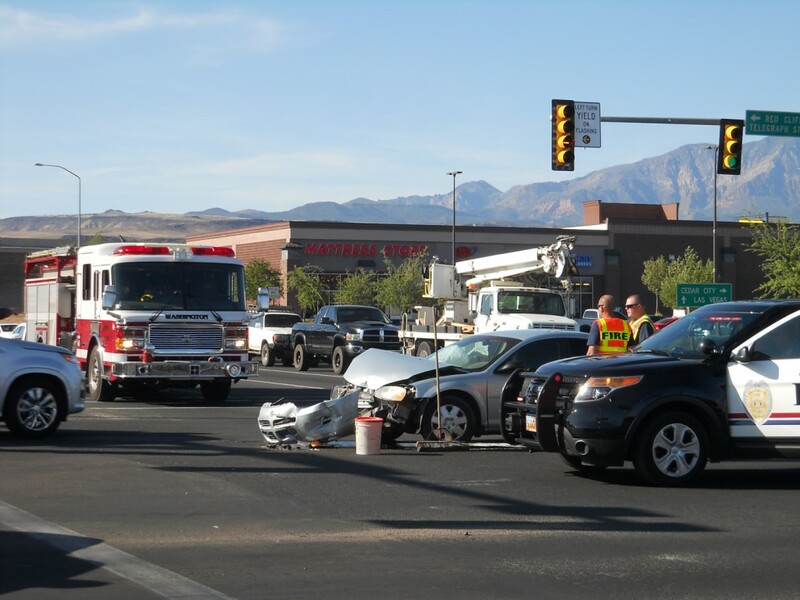 UPDATE April 26, 2014: In an email from Terry Gorgon to St. George News, he said that his wife witnessed the accident and was retained to make a witness statement. 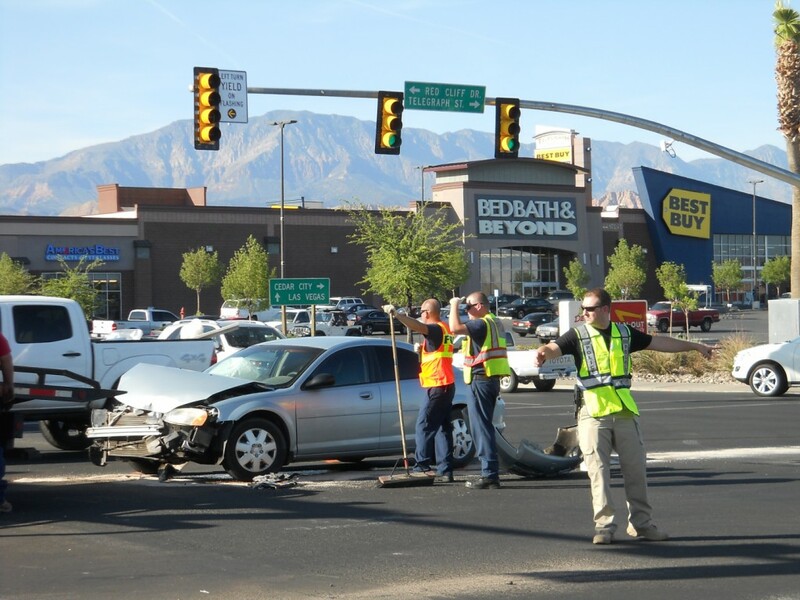 Comments to this report from others who state they witnessed the accident differ. Results of the investigation are not yet available as this update is added. This is why you are supposed to stop for emergency vehicles. 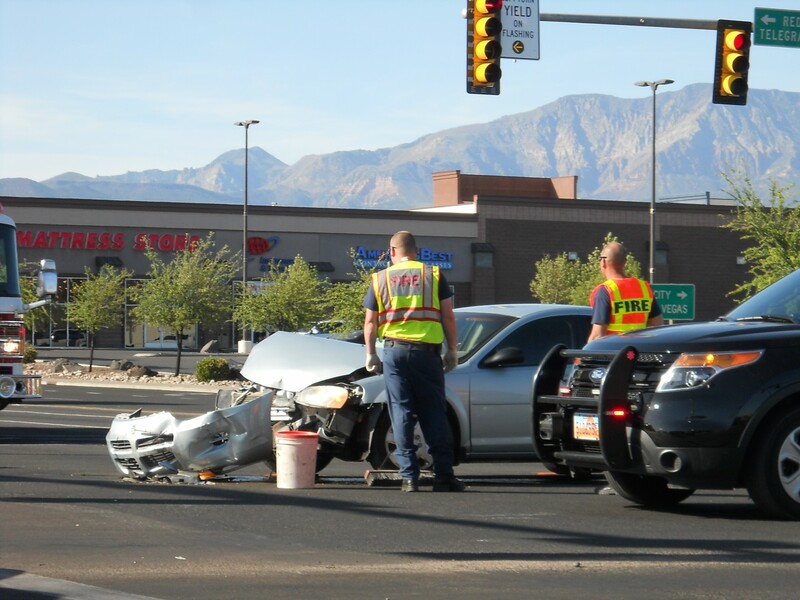 Cant tell you how many times I have seen people in stg keep on driving… people here really need to learn how to drive. They just need to realize that they are no Gods chosen child and pay more attention to their surroundings. This intersection is a nasty one…..especially during rush hour. When emergency vehicles enter an intersection and their signal is RED, even with lights and sirens they must make eye contact with the vehicles that have a GREEN signal to make sure they STOP “before” they go blazing through the intersection to save the day. Um Not so. They have a “duty of care” but they are not responsible when an idiot driving a Dodge Strata decides to keep going when everyone else is stopped…. Just IMO but here is the law that backs it up. I repeat the following section of the law that you have conveniently ignored. (4) This section does not relieve the operator of an authorized emergency vehicle, tow truck, or highway maintenance vehicle from the duty to drive with regard for the safety of all persons using the highway. Wow you didn’t even read the comment, did you? Thanks for displaying your ignorance. Please, for the sale of everyone, give up your driver license and take a bus from here on out. The car was third in line at a left turn. He followed the other cars through. He never saw lights or heard a siren. The cop was going way to fast for the situation. There is no way he didn’t see the cars turning left in the intersection he was about to speed through. He should have made sure he was seen before busting through an intersection. The person driving the car did not have line of sight to see the car coming or even time to hear a siren. He did not just ignore an emergency vehicle he was not doing anything wrong. When a Police Officer / Fire Engine / Ambulance, etc is using emergency lights and a siren, they are requesting the right of way! They do not automatically have the right of way. This is clearly the officers fault and Washington City should be paying for any medical bills and vehicle repairs that the citizen incurred due to this crash. The Officer should also be issued a citation for failing to yield the right of way, as would ANY citizen who runs a red light and crashes. This is NOT a bash on police, this is just the facts of operating an emergency vehicle. That means that the driver of the Dodge Strata is at fault for this accident because he failed to yield to an emergency vehicle. The Officer, in rush hour, could not have seen nor avoided the idiot that decided it was a good idea to keep on going when everyone else was stopped at the intersection. As far as I’m concerned, he or sh got off lucky. What if he or she had hit a pedestrian who didn’t make it completely across the intersection before the light turned green? Would you be on here arguing that it was the pedestrians fault for not walking fast enough? Again, not cop bashing, just the facts… The operator of an emergency vehicle does NOT have the right of way, he is asking for it. 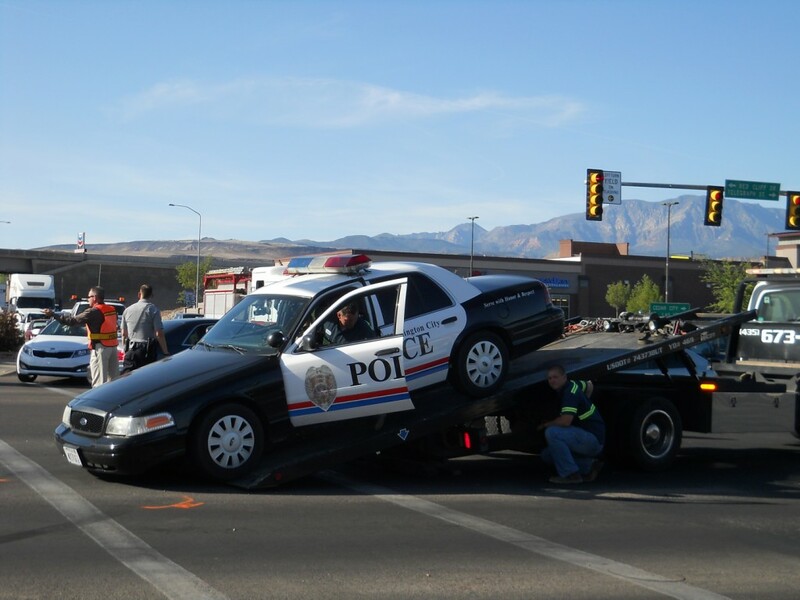 You canpost and re-post the law as much as you wish… This guy has spent over 20 yrs of his life operating said vehicle! I KNOW what the operator is liable for and what a citizen is required to do when they see said vehicle. Thanks! 2) you certainly wouldn’t put down one of your own without more concrete evidence. 3) you would have noticed that I acknowledged that they have a duty of care while operating a motor vehicle. 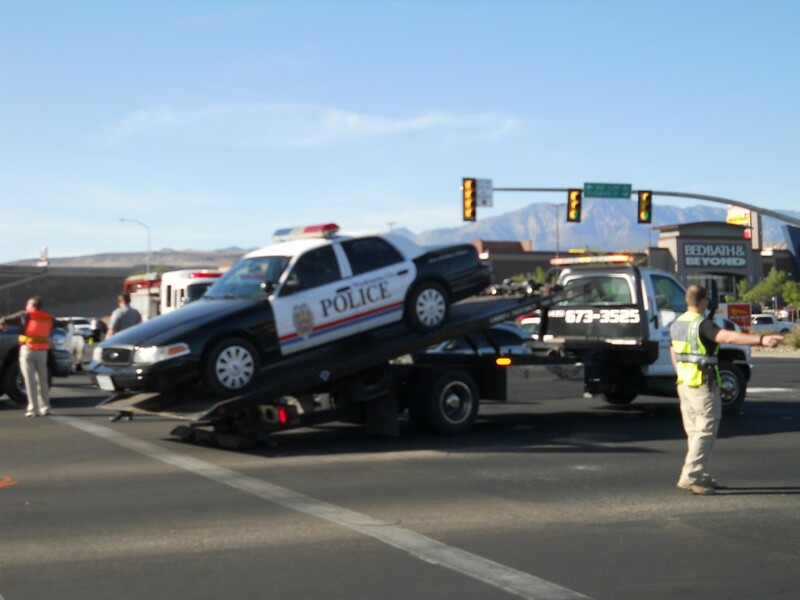 4) you would also have noticed that the article was updated to include a email from a man named Terry Gorgon who said that his wife was retained by UHP to make witness statement in which she said the officer did in fact stop at the intersection, look to make sure it was as safe as possible for him and others BEFORE proceeding through. I know you would have do e these things because, while I am not a cop myself, my father and indeed most of my extended family wear the uniform proudly. Oh yea, before I go, my dad retired honorably after 22 years. 🙂 Thanks. Joyce, is there any info on the previous wreck that the officer was responding to? Not that we have at the moment, KC, but it’s a good question for sure. We’ll let you know. Joyce, thanks for all you do to bring us the news! I’m sure a cell phone was not involved here. I was standing in the middle of the road in Ivins, wearing a flourescent vest, doing utility work, and had a mom in her SUV, phone held tightly to her head, fly by within inches. Not sure she even saw me. Chris, I’m glad your all seeing eye has reinforced the pervasive sheep mentality. Aspen, the headline was spot on. Yep. Everything is the governments fault. Right. Today some idiot decided it was a good idea to keep on going when everyone else was stopped at a busy intersection. He or she didn’t even care to look. Then again why should she have to? This is Utah after all and it’s the governments fault if she or she crashes right? What if it had been a pedestrian who didn’t finish crossing before the light changed? Would it be the governments fault when he or she gets killed because they didn’t give her enough time to cross the intersection? I hope not. Your mal-constructed thought process is a sad reversal of truth. What you may ask yourself, is, if an officer is speeding through an intersection, do you believe it would be beneficial for her to proceed with more caution. What if it were one of your loved ones crossing the crosswalk with an inattentive officer hell bent on NASCAR dreams? Don’t look now Chupacabra, your bias against law enforcement is showing. I will wait to see what the outside agency (UHP) report says about what happened. The trooper will dissect the witness statements and physical evidence at the scene and then make a judgement. I find it funny that so many comments on this board are instantly critical of each driver without having seen the accident. For those that witnessed the accident I hope you filled out a witness statement so that everybody gets a fair shake. As for Chupacabra, maybe you should be a cop so that you can make a difference and or see that it’s really like to walk in their shoes. Talk is cheap…. I’m glad everyone commenting on this was there and witnessed the accident…. Please read the law. I’ll even post it here for you. Please have your husband read it too…before either of you tries to drive again. Since you have no read the law and saw the accident, I have a Question for you; Did the officer turn to ram the guy who was stopped at the intersection or did the guy in the Strata just decide to go when everyone else was stopped? Do you ever tire of copy and pasting of links? The ones who say that cops or any other red and blues don’t have the right of way you would feel different if it was for you or any one in ur family. I was in the car in the right hand lane, ready to proceed thru the light when I heard the sirens. I stopped and the Dodge Strata was going so fast that it whizzed past me on my left and hit the police car. Really, a green light does not mean step on the gas and zoom thru intersections. It means go with caution. I saw the whole thing right in front of me.